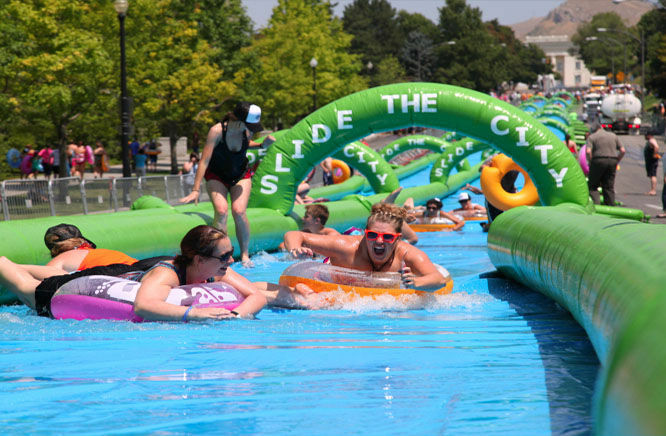 Don’t miss “Slide the City” this weekend in Downtown Huntsville! Slide the City is coming to the Rocket City for the first time TOMORROW! Downtown Huntsville will be transformed into a beach atmosphere, including live music, food trucks, along with the main attraction: a 1,000-foot water slide. The weather forecast looks promising, which will make for a perfect end of summer celebration! You’ll just want to be sure to pack your sunscreen, chair(s), water and a blanket/towel in order to take your experience more relaxing. Enjoy FREE live music from The Wolves of Chernobyl, Dirt Circus, and headliner Southern Halo! Don’t forget about the 25+ food trucks, Vendor Row, water activities, beach ball battle presented by Curse, and more! Huntsville police will close Church Street between Clinton Avenue and Williams Avenue starting at 5:00 a.m on Saturday until 8:00 p.m on Sunday. Take a look at the MAP showing where everything will be located downtown. And don’t forget to register HERE! Here’s to a FUN weekend!